^ ﻿Military and Security Developments Involving the Democratic People's Republic of Korea﻿ (Report). U.S. Department of Defense. (2012). http://www.defense.gov/pubs/ReporttoCongressonMilitaryandSecurityDevelopmentsInvolvingtheDPRK.pdf 2013年5月23日閲覧。. ^ Markus Schiller (2012). 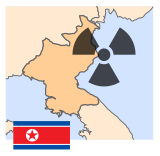 ﻿Characterizing the North Korean Nuclear Missile Threat﻿ (Report). RAND Corporation. ISBN 978-0-8330-7621-2. TR-1268-TSF. http://www.rand.org/pubs/technical_reports/TR1268.html 2013年1月19日閲覧。.